A guide and overview of the available Fuel Maverick wheels. Including one piece models: D536, D537, D538, D542, & D566. Two piece models: D260 & D262. The Fuel Maverick wheels are arguably the most popular model in the Fuel wheels collection. I wanted to break down all the different styles and options that are available because searching for all the information and be confusing and stressful. I want to try to make it as easy as possible for you. You can get sizes from 16″ up to 22″ in the Fuel D536 chrome model. The deep lip (which is pictured on the right in the image below) is available in the 17×9, 18×9, 18×12, 20×10, 20×12, 20×14, and the 22×10. On the image you can see exactly what the lip depth will be per wheel size. This number is listed in inches. There are multiple offsets for certain sizes. If you have questions regarding what an offset is, scroll down to the last paragraph in this article to help you out. These wheels are available in 5/6/8 lug applications. There is a PVD wheel available in the Fuel Maverick line, which is listed towards the bottom of this write up. The Fuel Maverick D537 is a great mix between black and silver. These wheels go great with all different colored trucks, Jeeps and SUVs. We really like this wheel because it gives a great custom look without being over the top. Pictured on the right hand side below, is the deep lip style wheel. The deep lip sizes available are: 17×9, 18×9, 18×12, 20×10, 20×12, 20×14, and the 22×10. If you want to know what each wheel size is for the lip depth, that information is on the image below and those numbers are listed in inches. The offsets are also listed on the image. For offset questions, scroll down to the last paragraph. The Fuel Maverick D538 Black & Milled wheels is the most sold of all the Fuel Mavericks. Right now the black wheel market is very strong and this color scheme goes great with all different colored trucks, jeeps or SUVs. With multiple offsets available, there is a style and look for everyone. If you have any questions regarding the offset or bolt pattern fitments for your vehicle, scroll to the bottom of this article to find out how to get those questions answered. There are sizes in this wheel ranging from 16″ up to 22″ with different lip depth’s available. See the chart below for all the lip sizes that are offered, these numbers are in inches. These wheels are available in a 5, 6 or 8 lug. 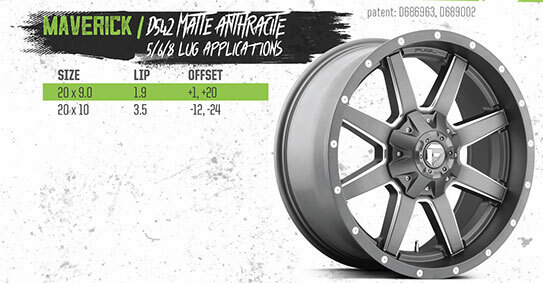 The Fuel Maverick D542 Matte Anthracite is a grey type of colored wheel. Not a whole of sizes or options to choose from in this color but nonetheless, still a great wheel. Below are the sizes and offsets with the lip depths (listed in inches). For any fitment questions regarding this wheel see the bottom of this article to find out how to get those questions answered. You can get these wheels in a 5, 6 or 8 lug. 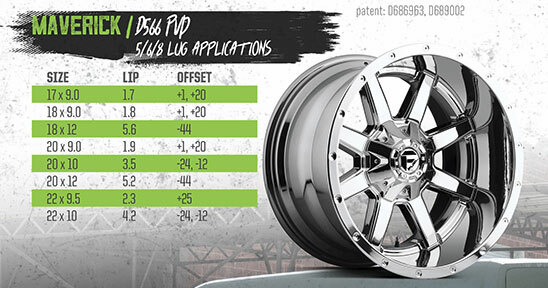 The Fuel Maverick D566 PVD wheel is a secondary choice between this and the chrome Maverick wheel. If you are wondering what the difference between chrome and PVD is, please click here. That article explains exactly what PVD is and why we like PVD better than chrome. PVD is the direction that most wheel companies are going and for good reason. On the chart below you will see all the sizes of wheels that are available. You will also see the lip depth (in inches) as well as the offsets that are available. These wheels are available in a 5, 6 or 8 lug. For any fitment questions or questions regarding offsets for your truck, Jeep or SUV, please call us or message us. We have wheel and tire experts that have been been in the wheel and tire game for a long time and they are ready for any questions you might have. They are available Mon-Fri 8:30am-6pm EST and Saturday 9am-4pm EST. We also offer a fitment guarantee or your money back. That is how confident we are in our wheel and tire experts. Click on the link to see not only all of our Fuel Maverick wheels but our entire line of Fuel wheels.